Valves are lanceolate with capitate ends. The central area is wider than rest of the valve. The valve margins may be undulate, with a central swollen middle of the valve. The valve face is undulate due to raised virgae. The valve face/mantle junction forms a sharp angle. The abvalvar edge of the mantle is shallower toward the valve apices, producing detachment of contiguous cells in girdle view. In girdle view, frustules are lanceolate, wider near the center of the valve. 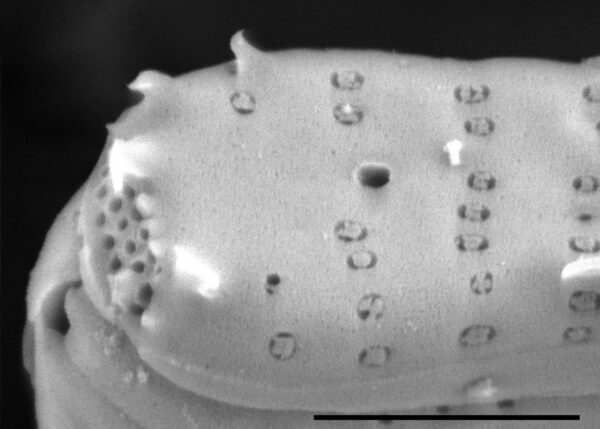 Cells form ribbon-like colonies joined by linking spines. The axial area is lanceolate, with clear fascia at the central area. 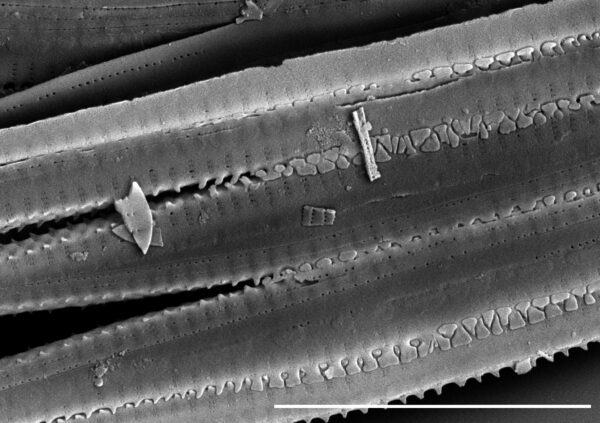 Striae are distinct, composed of apically elongated areolae (lineolae). 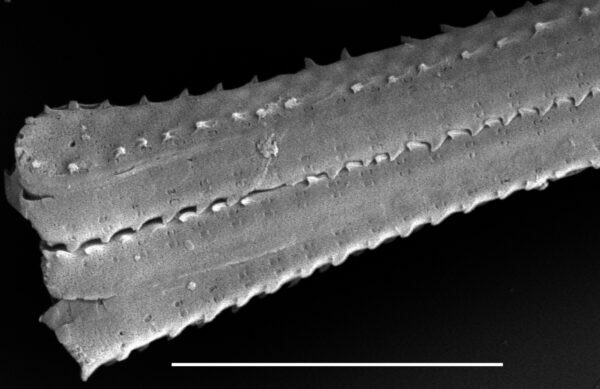 Striae are interrupted by spines. Striae are parallel throughout the valve and extend midway onto the valve mantle. Costae are wider than the striae. Spines are dimorphic; spatulate near the valve center and conical near the valve ends. Spines are present along the valve face margin, positioned in line with the striae. 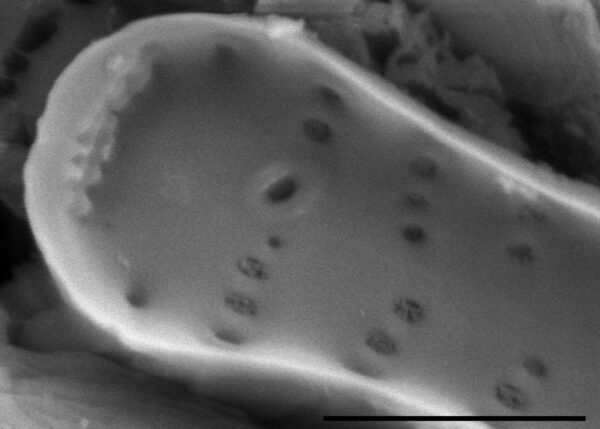 Well-developed apical pore ﬁelds with round poroids are present on the mantle at both valve ends. One rimoportulae is present on each valve. The rimoportula is located along a stria, close to the axial area. Copulae, or girdle bands, were not observed. 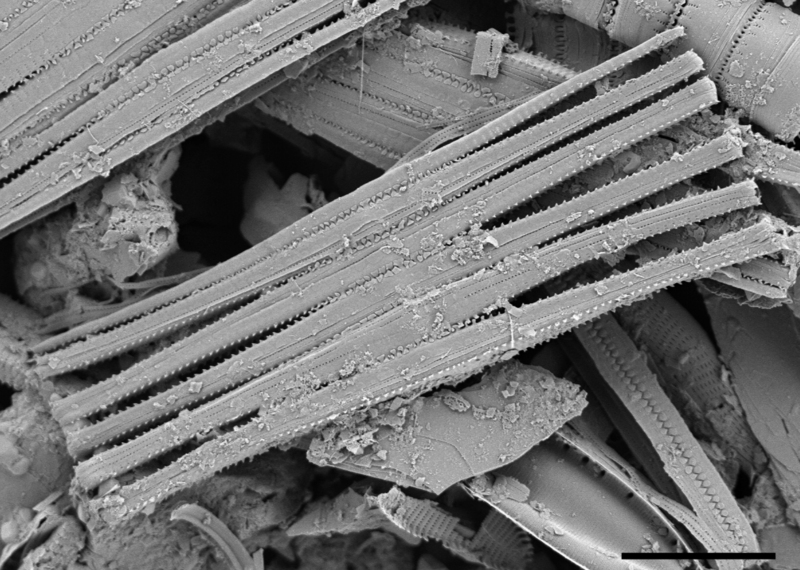 Fragilaria crotonensis is a common species in temperate, mesotrophic lakes of North America. Cells can be joined in large ribbon-like colonies. 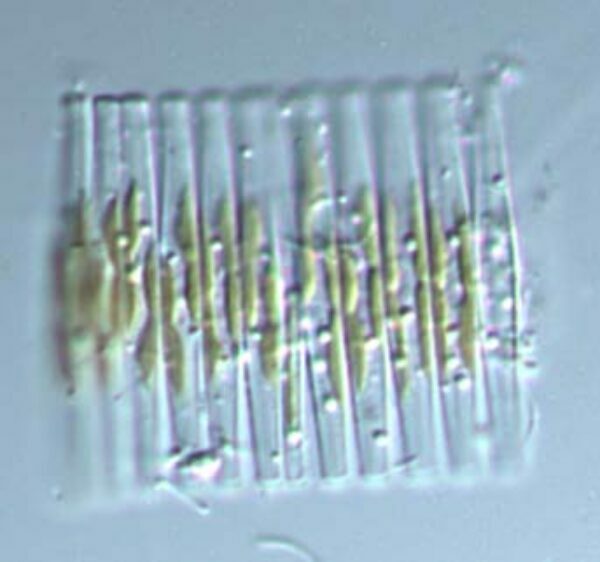 These colonies are resistant to sinking in the water column and help F. crotonensis maintain position in the phytoplankton. 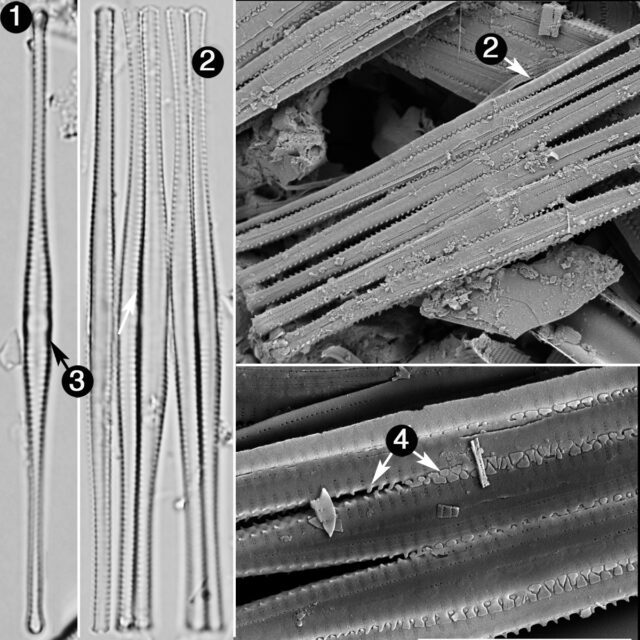 Fragilaria crotonensis, along with Asterionella formosa, is considered a marker that the levels of reactive nitrogen (Nr) have increased above the threshold in oliogotropic lakes of the western United States where diatom assemblages become more like assemblages in mesotrophic and eutrophic lakes (Saros et al. 2005, Wolfe et al. 2006, Spaulding et al. 2015). See the autecology of A. formosa for further discussion. Living colony of F. crotonensis. 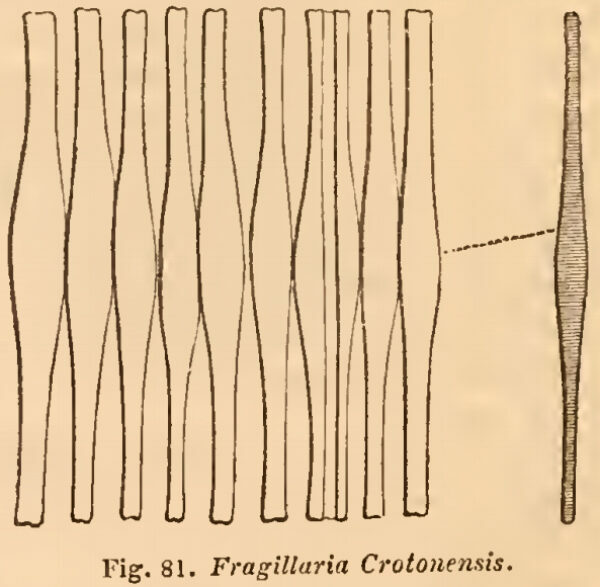 Fragillaria crotonensis, n.s., F. Kitton.-Frustules linear, inflated at the central part, where they cohere and form ribbon-like filament; valve narrow, acicular; striae faint, moniliform (fig.81).-Croton water, New York, Dr. Edwards. Valves are lanceolate, with an inflated central margin. Valve apices are rounded to capitate. Spines are positioned on the margin, a spine present at the end of a stria. Frustules are joined in ribbon-like colonies.